This season men’s wear inspired pajamas are everywhere and would make a charming joint gift. 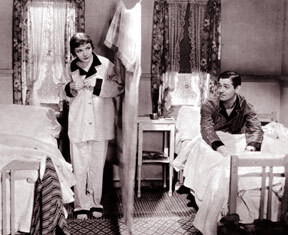 Couples could split one pair (good for the budget) a la Clark Cable and Claudette Colbert in It Happened One Night -she gets the top, he gets the bottom. 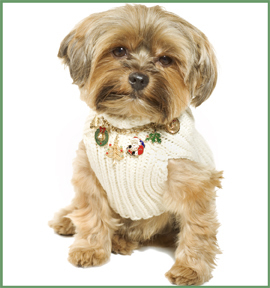 And to remind us of the charm of giving, here’s Albert adorned with my Christmas charm bracelet- you can find out more about charms in the book, “The Charm of Charms,” written by Ki Hackney and Jade Albert (Albert’s mistress and photographer). 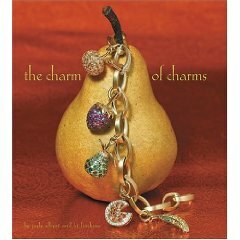 Don’t miss the opening spread where my personal charm bracelet is featured in this beautiful chronicle of people and their charm bracelets. See you next week with my suggestions for foodie-related gifts! In the meantime, don’t forget to check my website, www.deannalittellscharmschool.com!